Which to choose an SDK or an API and Why? SDK or API which is more suitable option for a developer and when? An API refers to a set of programming instructions and standards that a developer use to access a web tool or database. SDK is an implementation tools that means a complete set of software development tools for development of platform specific apps and it’s a collection of multiple APIs, documentation and programming tools. Even experienced developers sometimes find it daunting to opt between SDK or API. To build an application that will stand out from the ordinary ones require expertise, wisdom and lot of time. SDK is one such option to make these process easier for a developer. Both provide the ability to include innovative functionalities into existing apps. Let’s explore them to know the best option. Important features like security and communication are integrated smoothly into web and mobile apps using SDKs and APIs. Both provide same advantages but also display differences. An SDK has pre-built functionality makes development of mobile apps easier and faster without requiring in depth knowledge or having vast experience. An API unlike SDK is simply set of instructions where developers can be creative and achieve the desirable end result but in this case, having previous knowledge will be very fruitful. More importantly an APK will allow developers to mould the application on various perspective of the user. 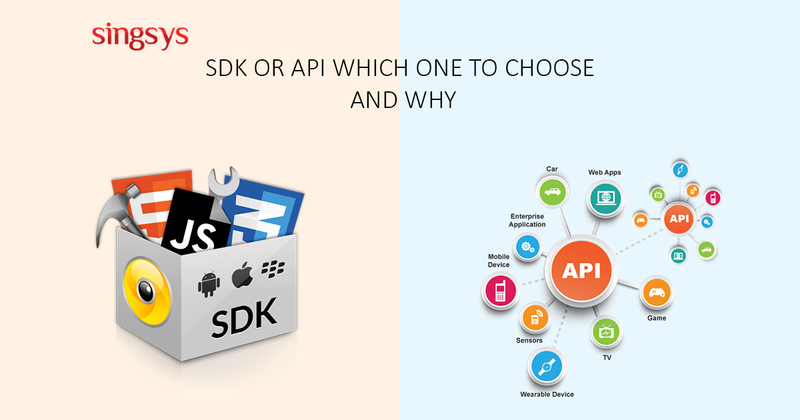 It is evident there are particular benefits associated with both but an SDK is more beneficial than an API in specific scenarios. Although I don’t support SDK over an API completely but, I am trying to clear the picture between both for better usage of both. Let us discuss few scenarios. Pre-built functionalities allow smooth integration of SDK within an app. It has the ability to smartly eliminate any integration complexity related to the creation of authorization signatures or parsing SMS messages either in native language or platform on behalf of its pre-built functionality. No need of expertise required over SDK to use it since most of them have evolved through advanced programming tools, documentation and sample code to ensure their seamless integration into the apps. In case of APIs complete knowledge about project supposed to be integrated is very much required apart from software development for API integration. This will result in added complexity associated with needed research and development. In order to ensure stronger security, system will be highly complex and require efforts from experts to develop, update and test it. This is where SDK outshines an API by ensuring business can add advanced security features easily into system to block fraud or storing sensitive data. SDK ability to be deeply integrated with native platform such as Android or iOS is responsible for end to end integration of services for ensuring completely secure solution which are mostly missing when using an API. The cost factor cannot be ignored while building a new platform and SDKs beat APIs again in here. A company will be able to save substantially on monetary basis with short rather fast development cycle time and as well as full-realized coding that are possible with SDKs. The changing landscape of competitive mobile apps users are bothered about latest functionality to be included in their app as well. Now latest feature are also supposed to be bug free and an SDK which is tested rigorously before launch as well as verified by various users in terms of stability, and reliability. APIs require quality tests before they are put in front of users and also integrated using software that are written from scratch. I don’t want to be biased towards SDKs as there are scenarios where APIs are powerful over SDKs.It is important for developers to deliver solution easily and quickly an SDK is therefore an optimized choice. After All, they are preloaded with enormous benefits to save time and resources as well as let developers to keep themselves updated with technologies without any extra indulgence in research. SDKs get latest enhancement by their companies which can be further shared with others who require them. If you are building a new mobile app and want to build with less development time yet add uniqueness to please users then prefer the SDK as it will delight you more than an API. Partner with Singsys to develop an engaging mobile, web and e-commerce application to turn your ideas into real working apps. Singsys has talented and certified pools of developers to design an affordable and attractive solutions for clients in compliance with industry standards using state of the art cutting edge technologies. Get Quote Now.